It would be easy today for visitors in Ronceverte to pass by one of the area’s most historic buildings without even knowing it. Down on Main Street sits the shell of Shanklin’s Grand Theatre, which at one time represented the heart of a once bustling little city. But interest in places like the old theatre–which go unnoticed and nearly forgotten–is not entirely lost. Eighth-grade student Wyatt Bair, of the Greenbrier Episcopal School, decided to learn more about the historic Shanklin’s Grand Theatre. 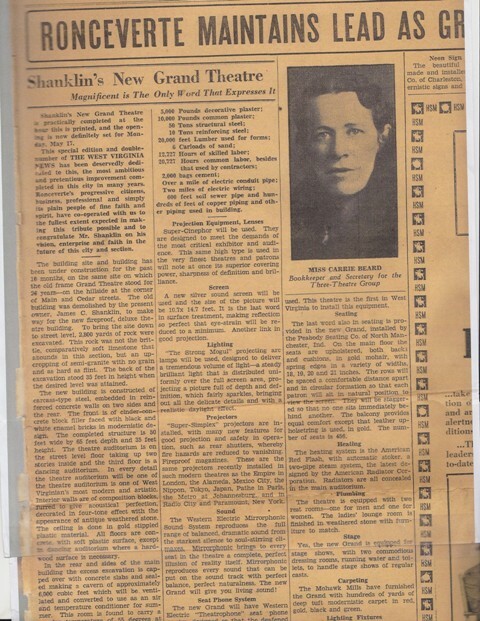 When it was open, the Shanklin’s Grand Theatre was state of the art. It had new materials, new designs, new equipment. It was segregated to accommodate both white and black people before integration and had a neon marquee that was the largest in the state. It had 158 seats for one screen, six of which were equipped with headphones for those with impaired hearing. 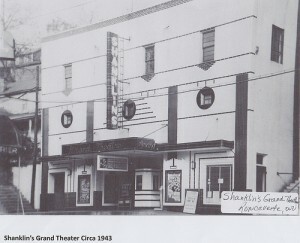 The Grand Theatre replaced its predecessor and namesake in 1937 and retained its status as “a centerpiece of the town”. 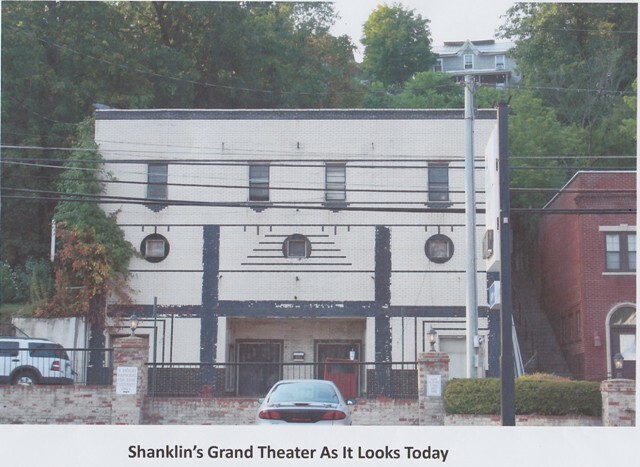 Shanklin’s Theatre was designed by John Norman Senior, one of the first African American architects in the country. It was segregated for blacks and whites. It had two sets of stairs so the whites didn’t have to use the same entrance as the blacks. Imagine how conflicting it must’ve been being an African American architect and having to design a building that was segregated. 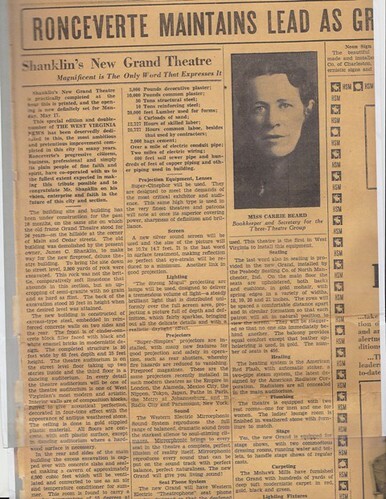 Shanklin’s Theatre, 1943. The theatre still sits at the corner of Main St. and Cedar St., also US 219, which passes right past the old building in Ronceverte. John Norman Senior designed the theatre to last. It had 60 tons of steel all together. The building’s walls were comprised of reinforced steel concrete. The building contained two miles of electric wiring and 210 square feet of vitrolite facing. Vitrolite is a material only made in West Virginia and not made today. Jim Shanklin, the owner and builder of the building, passed away in the forties or fifties, and the Watts had possession of the building in the sixties and seventies. Since then it has been converted into apartments, then remodeled. Finally, the once grand theater was left in a state of disrepair, and the building has been unused since the sixties. Now there is no roof, and a pile of rubble sits on the second floor. The building has rows of black and white bricks with the paint peeling off and old windows, undamaged, with dust and rubble behind them. The stairway has been blocked off by a tall wooden fence, and the doors and ticket window have been boarded over with plywood, also with peeling paint. There is no way to get in to the old building, but it still has that sense, whispering for me to explore it, and to go back to when it was open. Darrell Williams had possession of the building most recently. Darrell planned to donate it to the city, but he passed away before the final paperwork could be resolved. At the present time the commission is waiting for Darrell’s estate to sort itself out, and then they will start trying to find funding to repair the building. The commission’s first job if and when they gain possession of the building is to remove the rubble, and then from there we can watch the building get back to how its supposed to look. Inviting, explorable. Shanklin’s Grand Theatre has always been an intriguing building to me. And now there is hope that I can soon go in it and look around and just imagine how it was before. I can’t wait. I can’t wait to see a building with such heritage and history that has withstood the test of time and stupid teenagers (it is still un-vandalized), flourish into a building that stands tall and strong just as it did when it was built.